The White Mountains are a mecca for ice climbing - offering day trips to remote back-country adventures from lower-angles flows of ice and overhanging walls, to multi-pitch cascading waterfalls and alpine climbing on Mount Washington. 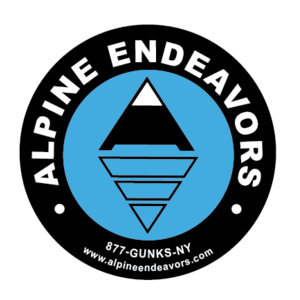 We offer professional instruction and guided ice climbing trips there from November through March. Cathedral Ledge - located just outside of North Conway, it provides single and multi-pitch ice and mixed climbing on routes such as: Goofer's Direct, Repentance, and many others. Crawford Notch - located on County RT 302, it includes; Frankenstein Cliff (Standard Route, Dracula, Chia, etc. ), Mount Webster (Shoestring Gully and others), Mount Willard (Cinema Gully, Hitchcock Gully, etc. ), and Willey's Slide. Franconia Notch - located on RT 93 near Lincoln, Franconia includes a large amount of ice: - Cannon Cliff (Black Dike, Fafnir, Omega, etc. ), the Flume, and more. Kancamagus Highway - includes many areas such as; Champney Falls, Painted Walls (Way in the Wilderness, etc. ), Sundown, and more. Mount Washington - backcountry, alpine-style routes consisting of long approaches and descents, and involved climbing. Areas such as; Tuckerman's Ravine, Huntington Ravine (Pinnacle Gully, Odell's Gully etc. ), and Kings Ravine. 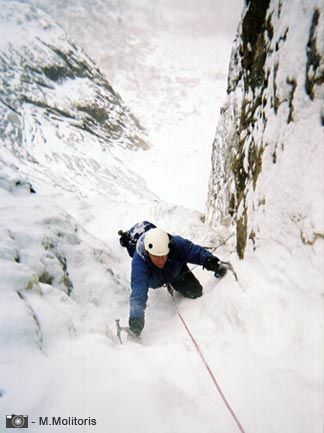 Rumney - this famous sport climbing area offers many great ice climbing routes during the winter.